Who wants to spend hours slaving over a stove in these hot summer months? I sure as heck don’t. 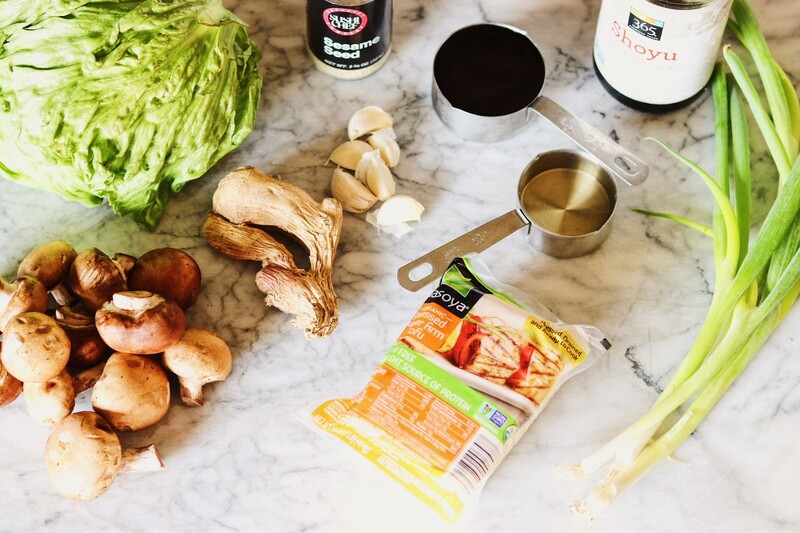 These Asian Lettuce Wraps check all the boxes as a fast, simple, and healthy recipe that delivers on the asian flavors I have been loving as of late. The lettuce cup here also makes this a super light meal, perfect for this time of year. Let me show you how I do it. With just 10 easily sourced ingredients you can have a delicious and healthy meal on your table within minutes. I know what you’re thinking TOFU?!?! One quick lesson on this stuff. It’s packed with protein, is easy to work with, and has a bland flavor profile meaning it soaks up flavor from whatever you marinate or toss it with. You can also find it almost anywhere these days. I chose to use firm tofu because I crumble it up and toss everything together. The firmness allows it to hold its shape while it cooks and gives more texture to the final dish. I have made this dish using strictly mushrooms and I adore it that way. My husband however wants something with a bit more substance so I threw in the tofu for him. If you’re not serving this with other sides or as part of a platter, I would recommend serving it with tofu as a main meal item. If you plan on serving it alongside other items, I think the mushrooms would be just fine. I cooked this dish in a cast iron pan but feel free to use whatever you have. I took the pan outside and set it on the grill so that I can be outside while it this pan of goodness comes together. To start, heat up a little bit of oil in a pan. Any neutral flavor oil will work here. Next, prepare your ingredients. 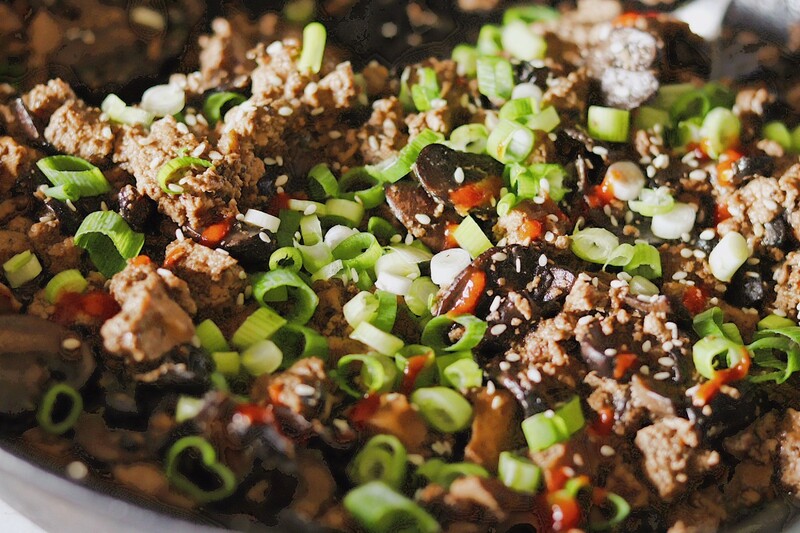 Clean and chop the mushrooms and scallions, drain and crumble the tofu, and peel the garlic and ginger. Mince the garlic and ginger and toss that in the pan over medium heat. Sauté until the garlic is just fragrant, about 30 seconds. Next add the mushrooms and let those cook down until they are about half the size. There is a lot of water in mushrooms so you will see that come out as it cooks down. Don’t worry, you will not have soggy filling, it will evaporate. I chose to use baby bella or crimini mushrooms here. 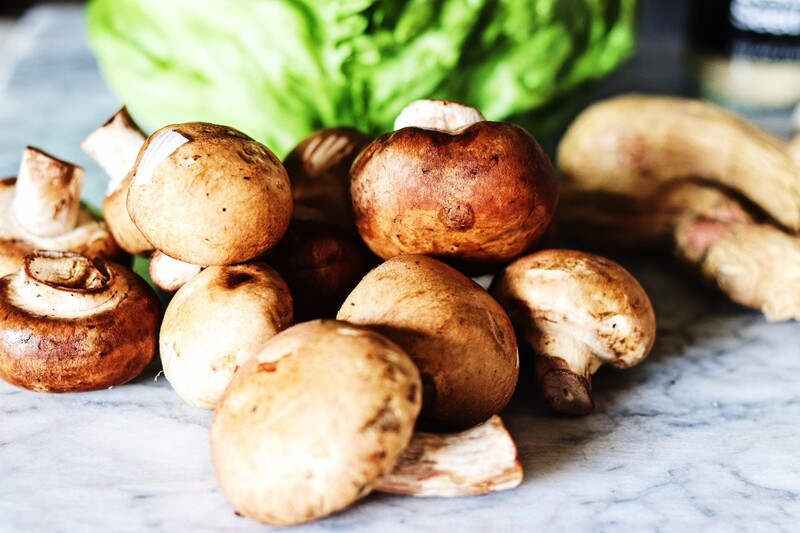 I would stick to this type of mushroom because it gives such a umami and meaty type flavor. You can also use portobello mushroom caps in this just chop them into cubes and toss in followed by the tofu. Once the mushrooms have cooked down about half way, add the sauce. This is a combination of hoisin sauce (make sure its vegan friendly), rice vinegar, and soy or any type of soy substitute such as coconut aminos or liquid aminos. If you are gluten free, try tamari. Add the sauces to the dish and stir to combine, allowing the mushrooms to cook down a bit more. Once finished, turn off the heat. Top the dish with scallions and white sesame seeds. Scoop the filling into lettuce cups and top with sriracha (my favorite) for a spicy kick. This is honestly one of the simplest and most flavor packed dishes you guys can make. The aromatics and sauce are everything here. If you make this recipe, please be sure to leave a comment and tag me @plantiful_grub on Facebook and Instagram. I would love to see your creations. Have a great Sunday everybody. This light, flavor-packed meal is a perfect summer lunch or dinner. This meal has just 10 ingredients and comes together in about 25 minutes. Heat a pan over medium heat and add the oil. While the pan is heating, chop all your ingredients. Add the minced garlic and ginger to the pan and saute until the garlic is just fragrant. Then add the mushrooms and tofu. Let the mushrooms cook down about half way. You will notice they will shrink as their water comes out and evaporates. Once this has happened, add the sauce. Continue cooking down the mushrooms and tofu in the sauce, about 10 minutes or so. Once done, take off the heat and top with the scallions. 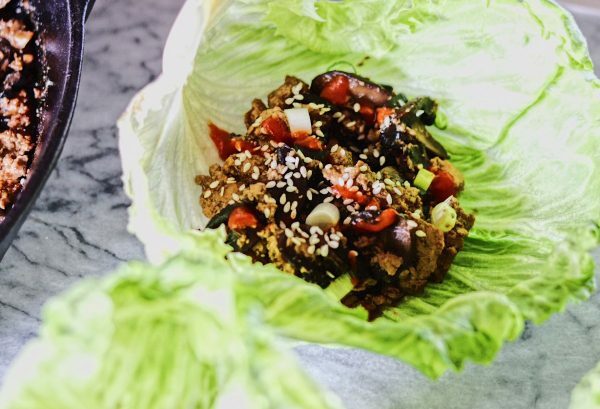 Scoop the filling into the lettuce cups, top with sesame seeds and sriracha and enjoy.